New Feature Visualise your conversion rate through contact stages. Zero BS CRM Funnels lets you visualise your contact acquisition stages, from Lead, through to Customer. See at what stages contacts drop off. Zero BS CRM Funnels extension lets you analyse how you are doing at converting your leads through to customers, via the interim statuses you define in ZBS CRM Funnels settings. See at which stage contacts are dropping off and at which point you should apply your focus to to improve the overall conversion rate from initial status, through to your final goal status. 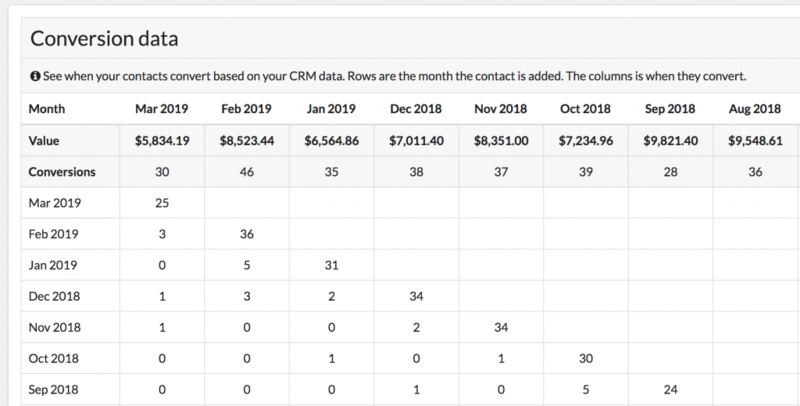 Use the conversion data table to see whether you’re converting your customers quickly, or whether it takes a bit of time from them discovering you and becoming a lead, to purchasing from you. Through date range analysis you can then compare whether your overall conversion rate is improving, and whether you’re getting more contacts into the top of your funnel to be able to see the overall impact on your business of refining your sales process throughout your CRM. Funnels is included in the Entrepreneur's Bundle - join the other happy entrepreneur's, save $$$ per year and get instant access to every extension! Integrate Zero BS CRM with Awesome Support Plugin and see your Customers support ticket information within your CRM. The ultimate sales dashboard. Track Gross Revenue, Net Revenue, Customer growth right from your CRM.